During the Nindies Showcase Spring 2019, Blaster Master Zero 2 was announced for Nintendo Switch. The events in the sequel, which is out right now, takes place a few months after the first game (Blaster Master Zero) where the game’s protaganist Jason, saves planet Earth. We have an official announcement from Inti Creates and Sunsoft and a trailer for Blaster Master Zero 2 below. Mutant Blasting Action is Back with Blaster Master Zero 2! Now Available Worldwide on Nintendo Switch & Playable at PAX East! Inti Creates (Chiba, Japan) March 20, 2019 – Inti Creates and Sunsoft are proud to present the along-awaited sequel to the Nintendo Switch launch title Blaster Master Zero. Announced during today’s Nindies Direct video from Nintendo, Blaster Master Zero 2 is now available for download worldwide on the Nintendo Switch eShop for $9.99 / €9.99 / £8.99. The story of Blaster Master Zero 2 begins a few months after the events of the first game (released on March 9th, 2017), where the main protagonist Jason saves planet Earth from the mutants. Jason’s partner and support droid of their battle tank SOPHIA III, Eve, was infected by mutant cells that have been slowly corrupting her body, so together with Jason and Fred the frog, they board their new battle tank G-SOPHIA and begin an intergalactic journey to Eve’s home planet Sophia in hopes of finding a cure for the mutant infection. A perfect blend of action-adventure through outer space and the signature Blaster Master gameplay creates a perfect formula for a fun new experience. G-SOPHIA’s Gaea System is the key to maximum mutant blasting efficiency! Get familiar with Jason’s new technique, the BLAST COUNTER. Power up G-SOPHIA and Jason as you travel across the galaxy! A whole new group of Metal Attackers with their own pilots and support droids takes the stage! 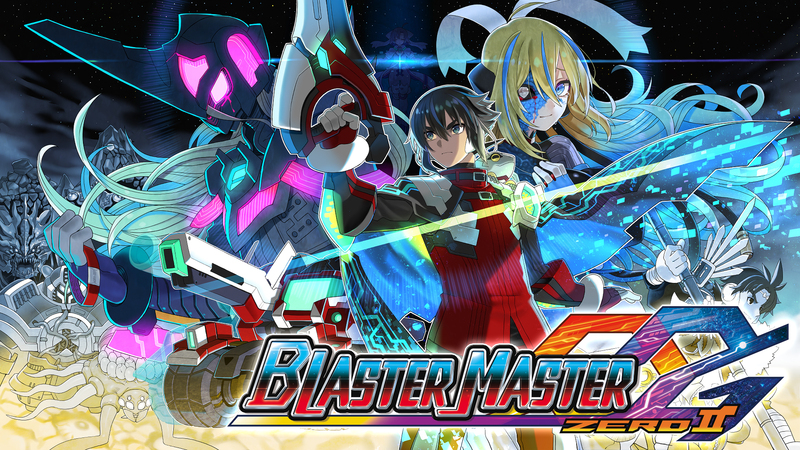 To celebrate the release of Blaster Master Zero 2, Inti Creates will be exhibiting the game at their booth on the show floor of PAX East 2019 from March 28 – March 31 in Boston, Massachusetts. Visit the Inti Creates booth (#24114) for Blaster Master Zero 2 demos, Inti Creates official merchandise, and daily pin giveaways where a different Blaster Master Zero 2 character pin will be given out each day.